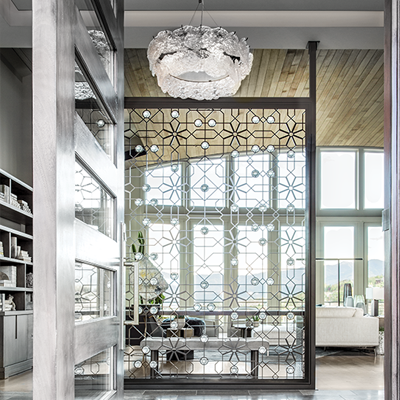 In Park City, a talented team turns a mountain home into a showcase of sophisticated and surprising design. "Anne-Marie Barton knows how to make an entrance. For proof, one only needs to step through the front doors of her recent project, a remarkably remodeled Park City home. Once a space completely open to the home’s great room, the new, spatially defined entry captivates with a dazzling art screen through which glimpses of the home’s updated interior and chic, new décor flow. “We wanted to introduce the unexpected from the get-go,” says Barton, principal of AMB Design."